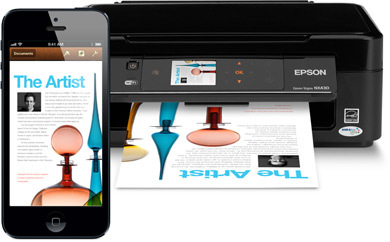 Printing wirelessly from an iPad, iPhone, or iPod touch to a printer is very simple, particularly if the printer in question is AirPrint compatible. Essentially AirPrint means the printer has native wireless support for direct-from-iOS printing, and setup is an absolute breeze. If you don’t have a printer yet or are thinking about upgrading and are shopping around, ideally you will get one of the designated AirPrint printers , thus allowing direct printing over wi-fi from any iOS device. They are by far the easiest to use and print to, but if you have an older printer or one that isn’t AirPrint compatible then we’ll also show you how to turn any standard printer into a wireless one by using a free solution available to both Mac OS X and Windows. This is the best method to print from an iPhone, iPad, or iPod touch, because the printing goes directly from the iOS device to the printer. It’s also extraordinarily simple to use. The requirements for direct printing are simple enough: the printer must be AirPrint compatible, and the printer and the iPhone or iPad must be on the same wireless network. That’s it. Printing multiple copies of a document is done through the initial “Printer Options” screen. 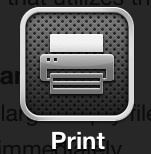 Just tap on the plus + or minus – buttons to toggle the number of copies to print. The document or item will print quickly. Incredibly simple. Most applications are compatible with direct wireless printing like this, including all the default apps like Safari, Maps, Photos, iBooks, Mail, and Notes. Many third party apps also support the feature. The Print Center application is only visible when items are either currently in the printing queue, or something is currently being printed. Other printer makers may have their own apps available on the App Store as well, if your make is not included in the list above just search for it from the store on your iPhone or iPad to find out. An excellent utility is available for Mac OS X and Windows which allows any printer to be transformed into one that is AirPrint compatible. The app is called HandyPrint and is the commercial product born from the AirPrintHacktivator app, and it will transform a normal printer connected to a Mac or Windows PC into an AirPrint compatible wireless printer that can be accessed from any iOS device. Though HandyPrint is a commercial app, the older AirPrint Hacktivator tool it was born from works with most printers and continues to be compatible, despite no longer being officially supported. 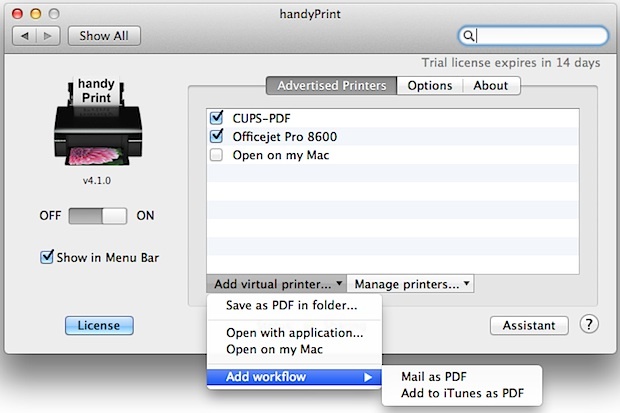 HandyPrint can also create a virtual printer on the computer, meaning you can print from an iPhone, iPad, or iPod touch directly to a file on the computer, much like you can print to a PDF on the Mac. 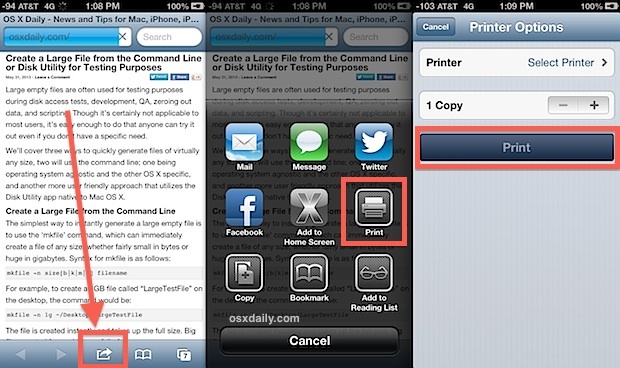 Note that if you’re just wanting to print an item to to a PDF file, you can do effectively take a webpage and print it to a PDF from the iPhone or iPad by using this bookmarklet trick.